While having a pint at Queen’s Head pub in England, Edward Craven Walker inspired by an oil and water-based egg timer, invented a cultural icon known as the Lava Lamp in 1963. Two years later at a trade show in Brussels Adolph Wertheimer and his business partner William M. Rubinstein bought the rights to manufacture and sell it in the US as the “Lava Lite”. The company started by Walker originally known as Crestworth was purchased by Cressida Granger and David Mulley and renamed Mathmos, a name taken from the cult 1960s film Barbarella. Today Mathmos still makes high quality lava lamps by hand in England. While Lava Lite LLC still sells Lava Lamps in the US today many Lava Lamp fans have noticed the quality of manufacturing and ingredients in the lamps has been declining over the years as production has moved overseas. 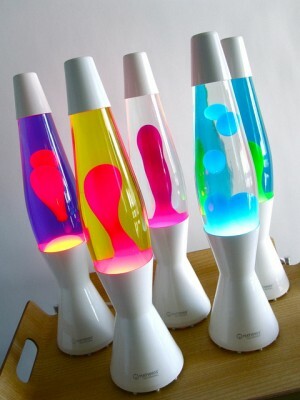 The cheaply made Lava Lite lamps just don’t flow as well as they used to and many have known to get cloudy over time. But now it seems Lava Lite LLC no longer has the exclusive rights to sell lamps in the US and Mathmos is now able to sell their lamps in the States. I have yet to see them in stores, but there are a few lamps available direct from Mathmos, but not the full line of lamps yet. This month as Mathmos celebrates the 50th anniversary of the lava lamp they will be releasing a limited edition lava lamp and a giant 200-litre lamp will be installed at London’s Royal Festival Hall. I still love my red and yellow remake of the original Silver Century lava lite lamp from the late 90’s which still works. Maybe one day I’ll be able to get one of these color changing Smart Astro lamps. For a more detailed history of the Lava Lamp visit flowoflava.com. This entry was posted by Fresh Dub on September 7, 2013 at 12:12 am, and is filed under Art. Follow any responses to this post through RSS 2.0. You can leave a response or trackback from your own site.